ISAIAH 32:2 KJV "And a man shall be as an hiding place from the wind, and a covert from the tempest; as rivers of water..."
1Behold, a king shall reign in righteousness, and princes shall rule in judgment. 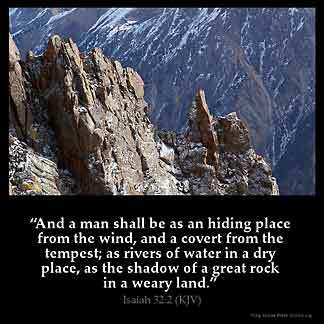 2And a man shall be as an hiding place from the wind, and a covert from the tempest; as rivers of water in a dry place, as the shadow of a great rock in a weary land. 3And the eyes of them that see shall not be dim, and the ears of them that hear shall hearken. 4The heart also of the rash shall understand knowledge, and the tongue of the stammerers shall be ready to speak plainly. 5The vile person shall be no more called liberal, nor the churl said to be bountiful. And a man shall be as an hiding place from the winde, and a couert from the tempest: as riuers of water in a drie place, as the shadow of a great rocke in a wearie land. And a man will be as a safe place from the wind, and a cover from the storm; as rivers of water in a dry place, as the shade of a great rock in a waste land. And each hath been as a hiding-place [from] wind, And as a secret hiding-place [from] inundation, As rivulets of waters in a dry place, As a shadow of a heavy rock in a weary land. 32:2 A man - Each of his princes. A hiding place - Unto the people under their government. The wind - From the rage and violence of evil men. As rivers - No less refreshing. As the shadow - In a dry and scorched country, which is called weary, because it makes travellers weary; as death is called pale in other authors, because it makes mens faces pale. To me this scripture is talking of Jesus. Praise God !!! Psalm 91 vs 1 says he that dwells in the secret place of the most high shall abide under the shadow of the Almighty. This man does these because he has a wonderful treasure- Jesus, in him. everyman can never have these lest Jesus reigns.